LONDON--(BUSINESS WIRE)--Technavio analysts forecast the global cookware market to grow at a CAGR of over 4% during the forecast period, according to their latest market research report. The growing emphasis on cookware aesthetics and functionality is one of the major trends being witnessed in the global cookware market 2019-2023. The growing customer demand for highly functional and ergonomic cookware products is attributable to the increasing awareness of cookware designs and aesthetics. Also, the shift toward sustainability, especially in developed economies such as the US and Western European countries, has resulted in vendors in the global cookware market coming out with earthy designs and modular concepts. With developments in printing technology, vendors can replicate stone and wood finishes on exterior surfaces of cookware such as pots and woks. Additionally, the shift toward smaller room sizes in households and modular kitchen designs have encouraged optimized utensil designs in cookware. Thus, the trend of optimal cookware design is expected to influence the global cookware market during the forecast period. The growing penetration of technology and Internet-enabled devices has contributed to several vendors in the global cookware marketplace to increase focus on e-commerce channels. While vendors such as TTK Prestige and Hawkins Cookers offer online purchase options through their company websites for customers, several other vendors have tie-ups with online e-commerce retail platforms such as Amazon. Offline sales channels such as retail stores continued to account for a major share of sales revenue for vendors in the global cookware market in 2018. However, factors such as increased spending by vendors on online advertising and the rapid development of Internet infrastructure in emerging economies such as India and China are expected to aid the online sales of cookware products. Therefore, the growing consumer shift toward personalized shopping through digital devices is expected to boost online sales over the forecast period. The global cookware market research report provides market segmentation by material (aluminum, stainless steel, others), and by region (the Americas, EMEA, and APAC). It provides an in-depth analysis of the prominent factors influencing the market, including drivers, opportunities, trends, and industry-specific challenges. The APAC region held the largest share of the market in 2018, accounting for close to 38% share, followed by the EMEA and Americas respectively. In 2018, the growth of the cookware market in APAC was primarily driven by the rapid penetration of gas stovetops and LPG connections in developing countries such as India and China. During the forecast period, the APAC region is expected to register the highest incremental growth as several consumers in APAC prefer traditional gas stovetops over induction cooktops. 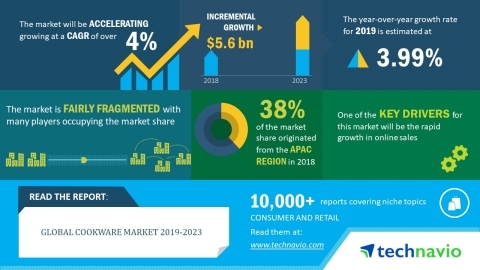 Technavio analysts forecast the global cookware market to grow at a CAGR of over 4% during the forecast period, 2019-2023.